Still waiting for the update and facelift to the Microsoft Office package called 2007. I've tried out the brilliant test drive on Microsoft.com, that lets you work with the programs on a remove server through Citrix. Ribbons are by far the most revolutionizing about the new UI, but here and there other things has been improved. E.g. 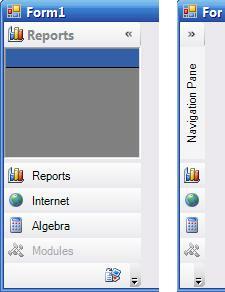 the navigation pane in Outlook. The items no longer expand and move, but the entire pane can collapse. It's a little hard to explain - you should see it. I liked the idea immediately and couldn't find an implementation online - so here it is. Completely managed of course. Download the solution.